Edward Tilsen started Twin City Building and Improvement Company in 1943 and founded Tilsenbilt Homes Inc. in 1952. He was an industry leader, one of the incorporators of the St. Paul Homebuilder Association, a National Association of Home Builders Vice President, and built homes featured in Better Homes and Gardens magazine in the mid 50's. To learn about one of the first integrated housing developments in the country, click here. Ed built homes in St. Paul, Minneapolis, Mendota Heights, West St. Paul, Duluth, and Tampa, Florida, using the slogan "Tilsenbilt means quality built". Son Robert (Bob) Tilsen continued the legacy, building Tilsenbilt Homes with his father under the names of Tilsen Construction Company, and on his own as Tilsen Homes Inc. and Robert Tilsen and Associates in Maplewood, Oakdale, Stillwater, Roseville, as well as St. Paul, West St. Paul, Mendota Heights, and Eagan. Bob was president of the St. Paul Homebuilders in 1958, one of the founders of the Builders Association of Minnesota, and also a Vice President of the National Association of Homebuilders. James Tilsen now owns Tilsenbilt Homes LLC. 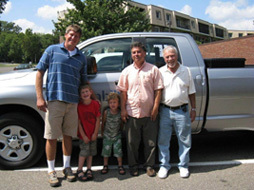 He has built homes or townhomes with Bob in Burnsville, Eagan, Maplewood, and Oakdale. Jim was president of the St. Paul Professional Builders Association in 1990; the first president of the Builders Association of the Twin Cities in 1991; and chair of the Builders Association of Minnesota Government Affairs Committee 1992-1994. Which leads to me; I’m Geoffrey Tilsen. I have worked in residential construction for over fifteen years as a cabinet maker, carpenter, and superintendent. In recent years I have worked on hundreds of remodeling projects including Basements, Bathrooms, Kitchens, Windows, Garages, Decks, Whole House renovations, additions and even various small home repair projects. I became the chief operating remodeler for Tilsenbilt in 2010. Tilsenbilt is a legacy of experience handed down from father to son. Our history is right at your fingertips. Contact me today to answer your questions.